Neil Armstrong as shown in “Voices from the Moon.” Visit collectSPACE.com to see the full frame of Neil Armstrong on the Moon. Ever sinceNeil Armstrong took his "one giant leap" onto the moon's surfaceforty years ago this July, the world has never gotten a good look at him duringthat momentous event. Neither the fuzzy black-and-white TV images transmittedto Earth, nor the handful of still photos taken of him on the moon showArmstrong well. Now, in a new book by Apollo historian Andrew Chaikin, a new image ofthe Apollo 11 astronaut taken early in the moonwalk brings readers face-to-facewith Armstrong on the moon. 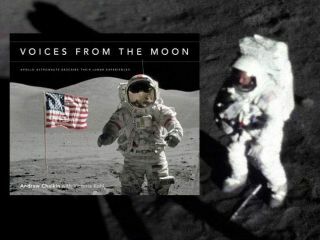 The book, "Voices from the Moon: ApolloAstronauts Describe Their Lunar Experiences," which is now on storeshelves, draws on the extensiveinterviews Chaikin performed with 23 of the 24 moon voyagers while researchinghis 1994 Apollo book, "A Man on the Moon." Chaikin, who co-authored the new book with wife Victoria Kohl, firstsaw the new image of Armstrong in 1986 while researching "A Manon the Moon," which became the basis for Tom Hanks' HBO miniseries,"From The Earth to the Moon." At the time, Chaikin was screening Apollofilm footage at the Johnson Space Center in Houston. "When I looked atthe footage of the Apollo 11 moonwalk, I saw something that really got myattention," Chaikin recalled in an interview with collectSPACE.com. In thescenes of Armstrong collecting the first sample of moon dust, Chaikin sawsomething he was not expecting: the astronaut's face. "I could see that Armstrong had raised his outer visor, the gold visorthat normally obscures an astronaut's face from view, and that was somethingthat always stayed with me as something that was very cool," said Chaikin. "So, when I got into "Voices from the Moon" and I wanted to makeuse of the bestmission photography that I could get my hands on, one of the prime things Iwanted to put in the book was a high definition scan of [that scene] with NeilArmstrong standing on the moon." Chaikinobtained a high-definition scan made by NASA of the Apollo 11 on-board motionpicture footage from Spacecraft Films, a company that has been remastering theoriginal footage for release on DVD. "I was able to get several, really good screen grabs from that sequence...and from those individual frames I chose what I thought was the best,"described Chaikin. "You can clearly see his face within the spacesuit. Tome, this one was the real keeper." Chaikin made "minimal colorcorrection and processing" to the image in producing it for the book. Theimage, in his opinion, is better than any of the 70 millimeter photographytaken of Armstrong on the surface. "There were other photographs of Neil Armstrong on the moon of course,taken with the Hasselblad camera. But none of those photos shows him from thefront in very good light," he explained. "Even though the Hasselbladphotography is inherently higher resolution then [the] 16 millimeter moviefootage still, in order to get the best view of Armstrong on the moon we haveto go to [that film]." "That's why I feel these frames ? in particular, the one I put in"Voices from the Moon" ? really are the best view we have ofArmstrong on the moon," declared Chaikin. Chaikin's use of the movie stills was not limited to Apollo 11 and NeilArmstrong. In "Voices from the Moon," he presents other missions' andother astronauts' images as a combination of still photography and film stillsto accompany the extensive quotes from his interviews. "I've always loved the type of storytelling where you can combine wordsand pictures," admitted Chaikin. "I have done it before in other space photography books and I reallyenjoyed getting back to that with 'Voices from the Moon'." "As I looked at these pictures, I began to want to hear the astronauts'voices talking about the experience. So, that was really the inspiration for'Voices from the Moon'," said Chaikin. To learn more about "Voices from the Moon", see author AndrewChaikin's website and blog at andrewchaikin.com. Click here tovisit collectSPACE.com to see the new image of Neil Armstrong onthe Moon, as well as video clips from the interview with Andrew Chaikin.